It’s that time of the year again – SIA, demo days, etc. 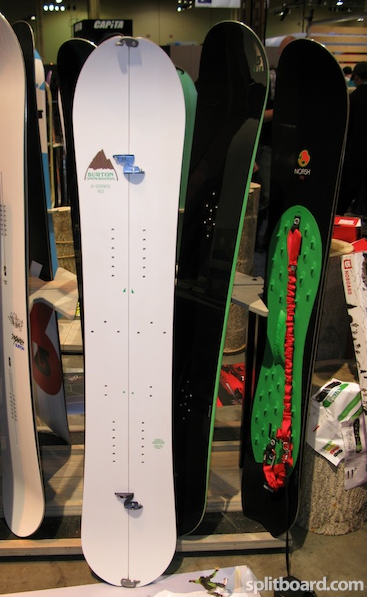 – where the manufacturers are starting to whore show next year’s gear to shops and influentials. Back in the archaic pre-internet days of 1993 you had to actually work for a shop or go to Bachelor if you wanted to catch a glimpse of the new schwag, but fortunately Tim Berners-Lee and Al Gore were snowboarders (skiers, you’ve been neglected lately and I apologize, your time is coming soon) and decided that Bachelor was too far of a drive and thus took it upon themselves to invent the internet to facilitate ease of gear ogling. Note that some companies are still *burton cough cough* caught off-guard when their catalogs get scanned and hit the internet. Do you like tapes or C&Ds? Anyways, that was a long-winded (unfunny thanks to a few glasses of wine – yeah, I know, usually I’m a beer guy but need to cut back on the midweek brewskis since Fairtex is sadly closed this week) intro to this peek at next year’s splitboards. The big trend from the frontcountry is making its way to the backcountry and more manufacturers are adding rocker to their factory splits after some initial hesitation that it would make for harder skinning. Sadly the rumors that have been swirling for a few years now of a Mervin “Banana split” factory splitboard are apparently false according to a conversation I had with Temple a few weeks back – said he even had to split his Billy Goat on his own. They really need to make this board if for nothing for their marketing department. One of the great sensations of this season has been the freeride Poacher table, that for the coming winter has been improved, with a very aesthetic line with the respect that we have to feel for the natural environment where we develop our sport. To highlight the semi camber reversed to give the boards of some major benefits in the practice of freestyle without losing benefits in driving. A technology that is present in the tables Axum, Banger and Pivot, which has been christened the Pop Rocker. After reading that I’m not sure if the board has been changed or not, but I do know the new topsheet with it’s Thomas Campbell-esque patchwork look is a substantial improvement from the ’09 model. Next up is the Prior AMF which I covered yesterday but will throw the image up again as the splitboarding world doesn’t move quite as fast as the regular shredsled world. With the Prior boards keep in mind they can be made to order, you get to choose your topsheet and your base graphic, think NikeID meets the snowboard world, just without the annoying child labor guilt trip when you walk through Berkeley. If you can’t find them at your local shop (and odds are you won’t) you can grab them online at REI. Of all the splits odds are this is the one your local shop will have. If not you can find it here, here, and here. Venture, a company most are unfamiliar with out of Silverton, Colorado run one helluva operation, always keeping on eye on minimizing their environmental impact – in fact their entire operation has been wind powered since 2004! That’s the kind of thing we need to see the big guys step up to as well and I applaud Venture for the steps they’ve taken. For 2010 Venture will be making all of their boards available as splits, two of which are rockered, one of which is cambered, and the last you’ll have a choice as to whether you want rocker or camber. The only pic I’ve seen of any of the 2010 splits is below. If you’ve never seen a Venture snowboard you’re missing out, these things are BEAUTIFUL. According to their site these will be available online at Backcountry.com, but Venture said they are still manfacturing the product so their online retailers don’t have it listed yet. I’d keep checking back. Last up, at least as far as this post is concerned (there may be a part 2….) is the 2010 offerings by Voile. From what I’ve heard the Mojos (the blue/green/red boards in the background – I think they are going for an earth/wind/fire theme) are unchanged. However, take a look at the wood board board in the middle. ONE NINETY FIVE. Looks like Yao Ming finally has a park board. Anyways, I’m out of wine and thus done writing for the night. I stole a lot of these photos (well, I’m hosting them so it doesn’t ring up his bandwidth costs) from Chris Gallardo’s site splitboard.com, so make sure you check out his site because he’s a nice guy and really helping to lead the push for manufacturers to stop ignoring the splitboard market. 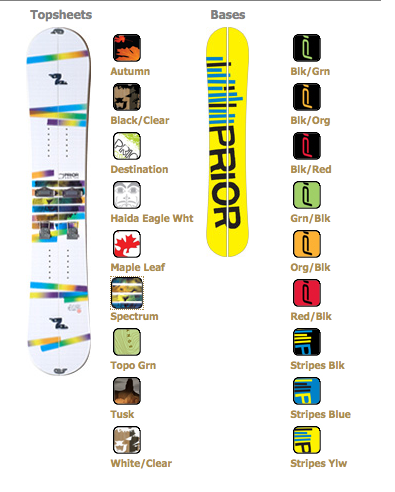 you forgot to mention the tom burt pro model split board by winterstick and “the solution” by jones snowboards. That was written in March of last year, before Tom Burt’s split was announced (which still isn’t available for purchase on their site) and while Jones Snowboards was still just a glimmer in Jeremy’s Rossignol sponsored eyes. I’m not saying ski resorts lie, buuuut….